You could fill the House of Commons with the notable accomplishments of Geroy Simon. There are the three Grey Cup rings. You have to mention CFL all-time records in passing yards (14,756), receptions (904) and touchdowns (93). Who can forget winning the league’s Most Outstanding Player Award in that memorable 2006 season? All things considered, last week’s announcement trumps all of that. Superman was still flying on cloud nine after he was announced as part of the 2017 Canadian Football Hall of Fame class. He joins an impressive group: former Lions’ running back Kelvin Anderson, former linebacker Mike O’Shea, all-time leading passer Anthony Calvillo are also heading in along with builders Stan Schwartz and Brian Towriss. The Lions’ Super Scout got to enjoy his first few hours of combine week in Regina after getting the call to the hall. 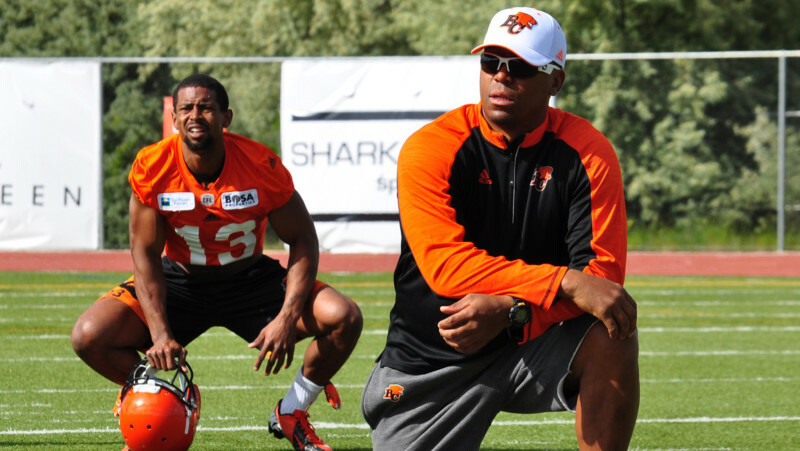 “The Canadian Football Hall of Fame is the Big Kahuna for me,” said Simon of where it ranks. A modest guy at heart, Simon insists the call a couple of weeks ago was not expected. “I was shocked because it was something that wasn’t even on my mind. I was doing some scouting stuff that morning and my phone rang. It was a Toronto number and I thought it was an agent. It was the Commissioner and I was shocked when he said who he was and why he was calling. There were several attempts to crack an NFL roster. 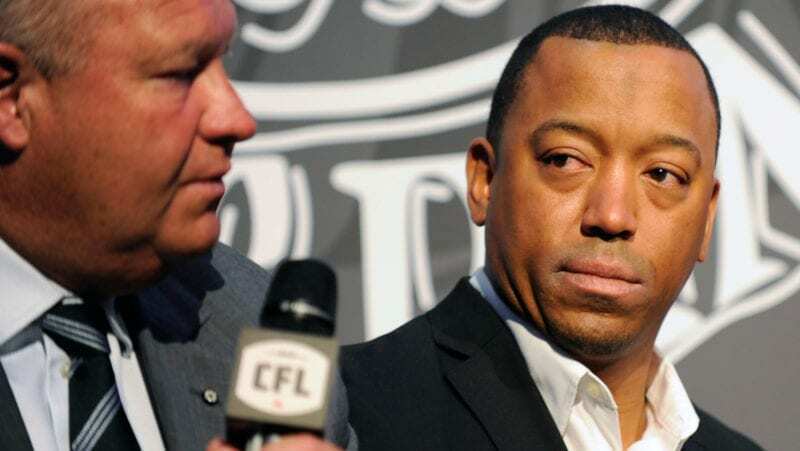 He then started his CFL odyssey in Winnipeg and ended right here in Saskatchewan — the announcement gala took place inside the sparkling new Mosaic Stadium — but Geroy defines Lions orange. Hard nosed, willing to pay the price and always willing to have his number called when the Leos were in need of a momentum-changing play. Like every other Hall of Fame player, Simon played with great teammates. One that will always stand out is Dave Dickenson, who was inducted as part of last year’s class. No. 81 is never slow to remind everyone the re-birth of the franchise occurred when Wally Buono brought the quarterback here in 2003. “I always say Dave is probably the best quarterback that I ever played with on any level,” proclaims Simon. It was no doubt not an easy situation for Dickenson to step into after his attempts at cracking an NFL roster. The Montana legend could easily have headed back to Calgary, where he still had a home and plenty of currency in the football world. Simon helped him make the seamless transition. Both fed off each other and have Hall of Fame careers at the end of the day. “Geroy was a guy who elevated his performance when he was on the field for games. He enjoyed the bigger stage,” Dickenson told Stampeders.com. The 2006 squad was a machine. So was the one in 2007 that finished 14-3-1 in the regular season. But as we know, the only years that get remembered are the ones that end with sipping from Lord Earl Grey’s mug. “It was one of those magical years where you are rolling along, you know you’re going to win and it’s just a matter of not screwing it up,” adds Simon on his first championship season. 2011 was magical. We’ll admit his 2013 victory with the Green Riders was pretty special too. But as the old saying goes, you never forget your first. All of these accomplishments are pretty remarkable for a man who decided to quit football and go work for Under Armour before coming north. The change of heart did him and the Lions a whole lot of great. I will echo my friend and former sports radio colleague Don Taylor, who always says Geroy will go down as perhaps the best pro athlete to play in this province. I’d be willing to go there. Geroy was just that good. His ability to come up in the clutch when the Lions needed a big play is what defined his legacy in orange. Speaking of those clutch moments… One of my favourites was the last second touchdown catch from Spergon Wynn to stun Saskatchewan 40-38 in the 2004 regular season finale. Although the Lions had already locked up first place, it forced the Riders to go on the road to start the playoffs and also provided a great prequel to the Western Final two weeks later. It defined that magical 2004 bounce back year: Never boring and certainly never out of a game. Not a bad trifecta for Superman either: In the last eight months, Geroy has become a member of the Cambria County Sports Hall of Fame, BC Sports Hall of Fame and now the Canadian Football honour. The induction to the BC Sports Hall will take place at the Banquet of Champions Dinner April 12. He flew to his native Pennsylvania for the Cambria County festivities last July. I am pretty sure I echo not only every lifelong Lions fan, but everyone who supports our great league when I say: Thank you Superman.